After successfully configuring your secure conection to SureFiles™, you may now map your shared drives. You accomplish by following the steps below. If you do not see this icon, double-click on the Citrix Access Gateway lock icon on your desktop and log in. If there is no icon on your desktop please follow the instruction on setting up your secure conection to SureFiles™. 1. Open "My Computer" from your "Start Menu->My Computer" or by using your "Windows + E" key shortcut. 2. Cick on your "Tools" menu and select "Map Network Drive..."
3. SureTech.com has set up two different drives you will map to. First is a Corporate Drive and second is your own Personal Drive. The Corporate drive contains folders for different departments in your organization such as Finance, HR, Technology etc... 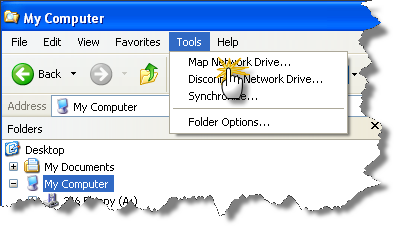 Your Personal drive is empty by default but allows you to create folders and files as you wish. For simplicity and consistancay we recommend that you use the drive letters "S" and "P" for these drives. S stands for "Shared" and and P stands fir "Personal", however you may use any available letter if these drive letters are already mapped to a different location. 1. Select the "S:" from the drop-down for your drive letter. If "S:" is already taken by another drive please use a drive letter that will make sense to you. 2. Type the following in the "Folder:" text field: \\surefiles1.suretech.local\corporate\ (note: in the image below the "\corporate\" part of the path is cut off, please type the full path). 3. Insure that the "Reconnect at logon" checkbox is checked. 4 Click the "Browse" button. 5. In the "Browse For Folder" window click your company name. In this case you will see "SureTech.com-HQ", however your company name will be your own. 6. Click "OK" then "Finish"
1. Select "P:" from the drop-down for your drive letter. If "P:" is already taken by another drive please use a drive letter that will make sense to you. 2. Type the following in the "Folder:" text field: \\surefiles1.suretech.local\employees\ (note: in the image below the "\employees\" part of the path is cut off, please type the full path).